November 12, 2015 ~ Sara W.
I truly enjoy reading books with my children. This should come as no surprise after my Read to Your Child post. Picture books with a good message are my weakness. One of my favorites is a Cautionary Tale of Flattery called The Spider and the Fly . 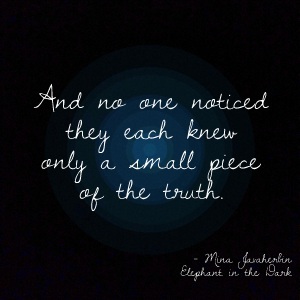 On my last trip to the library, I had the pleasure of finding Elephant in the Dark . Prior to reading it, I knew nothing of this book nor the story it was based on, which is commonly called “Blind men and an elephant.” It’s truly a fascinating perspective, and ironically, once I explain the gist of the story, it has several different interpretations. As I finished reading Elephant in the Dark , I concluded that every adult needs to read this book. My Facebook has become so cluttered with who’s right and who’s wrong, that it’s disheartening. I realize you already heard my rant on this topic in Accentuate the Positive, but this book just brought it to the forefront of my mind again. It also reminded me of this quote I read by the US Secretary of Agriculture and 13th President of the Church of Jesus Christ of Latter-day Saints, Ezra Taft Benson. He said, “Pride does not look up to God and care about what is right. It looks sideways to man and argues who is right.” Religious or not, the idea that being right is more important than the whole truth gets us nowhere as a society. Sometimes I feel bad that I don’t have an adamant opinion on all things. Starting this blog made that more evident in my life. I knew if I had a more extreme opinion on a matter, I could draw a larger audience. Shock factor sells, right? At first I thought I was just too ignorant to form an opinion on hot topics. Then I realized, it’s that I can see where others are coming from, for the most part. I’m not perfect in this way by any means. But I would like to believe that I don’t just go into the barn, feel one part of the mysterious creature, and assume I know all based on that single instance. I have opinions on all sorts of things, don’t get me wrong, but I also understand that it’s my opinion. Some of my opinions have facts to back them up, some don’t. The last thing I want to do though is ever express my opinion in such a way that demeans somebody else’s viewpoint. I don’t want to fight about who is right. I’m okay with learning more about the whole creature. But, I’m also okay with being considered wrong in someone else’s eyes. On that same note, I’m also okay being wrong in my own eyes. For me, it’s not about who is right, but what is right. Because of that thinking process, I’m not afraid to learn more. I want to understand the whole creature. Period. I love one of the interpretations of this story, made into a poem by Rumi, a 13th-century Persian poet,which Elephant in the Dark is based on. Rumi’s poem ends with, “If each had a candle and they went in together the differences would disappear.” I think of that line and wonder what our world would look like under those circumstances. I imagine, as it pertains to this story, we would all be unified in understanding it was an elephant, but we would still have our opinions on the creature. Perhaps one person would find the elephant ugly, and another would find it breath-taking, but both would agree it was an elephant. Neither person needs to be wrong in their feelings towards the elephant. We can respect differing interpretations of the creature, while simultaneously agreeing that there is a greater truth that there is no disputing. Oh, how I hope I was able to express my feelings on Elephant in the Dark and it’s greater meaning. The concept was over my toddler’s head, as I read the book to him. But, I’ve found myself reading it over and over on my own. There is much to take away and ponder about this story. Take a moment and reflect on the story, if you have some time. I would love to hear other’s feelings on the matter. Yeah, Laura! I think we’re on the same page. I thought about that multiple times while writing the post. Thanks, as always, for your support!